It’s 12 long years since Robbie Williams delivered his standout swing album ‘Swing When You’re Winning’. The cheekily-titled set (a play on his previous album ‘Sing When You’re Winning’) featured a collection of swing standards like ‘Mr Bojangles’, ‘Straighten Up And Fly Right’ and the Nicole Kidman duet (and lead single) ‘Somethin’ Stupid’. 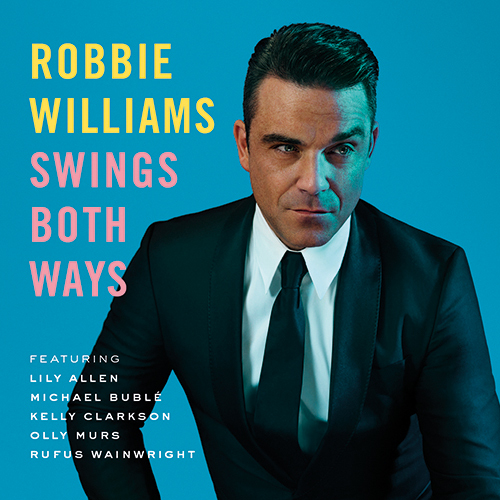 Now Robbie’s set to swing again, with his brand new (equally cheekily-titled) collection ‘Swings Both Ways’. This time around, however, there’s a little less emphasis on the classics and a little more on his rekindled writing relationship with Guy Chambers, with who he’s co-penned lead single ‘Go Gentle’. This time around, there are vocal collaborations with Lily Allen, Olly Murs, Kelly Clarkson, Rufus Wainwright and the man who’s seemingly got the “cool” market covered… Michael Bublé. To celebrate the album’s release today, the lovely team at EMI have shot through five copies to us – and we’re dutifully giving them straight away to you. Furnish our inbox with an email which contains your name and postal address. In the subject line, pop the title “Swing Robbie My Way” and we’ll pop you into the draw! The competition will close at 10:00pm AEDT on Friday November 22, 2013. Only one entry per residence and email address will be accepted. Open to Australian entries only. Winners drawn entirely at random. Winners’ first names, suburbs/towns and states will be published on the site on Saturday November 23, 2013. Five lucky readers will each receive a copy of the new Robbie Williams album ‘Swings Both Ways’, with big thanks to the team at EMI. And don’t forget, we’re not planning on sharing your details. Nor adding you to any evil mailing list, nor selling your details on. That’s not our schtick.